Let’s face it, most photos really aren’t as good as they could be. And too many are utter failures. Why is this? What makes a photograph good or bad? How can we take a photo from concept through execution and make it great? The answer, my friend, is photographic design. Never heard of it? You’re not alone. I’m about to share with you secrets that very few photographers know. And fewer actually practice! Yes, it does include composition… but photographic design is so much more! It starts with your conscious intentions and then working to a plan, constructing the best possible image in the camera and crafting it with care all the way to the fulfillment of its beautiful potential. I’m Nat Coalson, a professional photographic artist and educator. For over fifteen years, I’ve worked with thousands of student photographers and have identified the areas where most get stuck. Throughout my entire adult life, I’ve rigorously studied the masters of visual arts and photography. And I’ve gained deep knowledge about how we human beings see and how we appreciate visual beauty. And now you can learn all this, too! Now is the time to take control of your creativity and master the process of building dynamic, powerful photographs that effectively communicate your vision. This online course includes self-paced video and downloadable content so you can learn at your own speed. Most importantly, you’ll also get one-to-one, private coaching plus live webinars and group discussion forums. If you’re serious about your photography but have struggled to achieve the results you’re looking for, this course is for you! And I guarantee that if you learn the concepts, apply the methods, and practice the techniques I’ll teach you in this course, all your images will improve… starting immediately! “Nat, being the patient and perceptive teacher he is, has a way of leading you to look more carefully for the extraordinary amid the ordinary. The time with Nat has been a game changer. He is one of the best artists I know for inspiration, vision, growth and helping you capture all things beautiful.” —Teri G.
“Nat is an excellent teacher who makes complex technical subjects easy to understand and to implement. He is also a great teacher of the artistic dimensions of photography. Participating in his field workshops, as well as private coaching sessions, has helped me become a better photographer.” —Ron C.
“This was unquestionably the best workshop I have attended. An almost perfect balance between shooting and image processing/critique, the workshop covered the entire photographic workflow, from pre-visualization to final image critique.” —Dan G.
“I have taken several photographic workshops over the past few years and have found the ones that I took with Nat Coalson to be the best. Nat is very knowledgeable, has a great feel for the camera and post-production (Photoshop and Lightroom etc) and is inspirational in spurring you on to reach greater goals and to learn more about photography (and to enjoy it).” —Frank D.
“Both my compositional eye and technique improved very noticeably from your instruction. I was visualizing as I composed the shots how they would later look after post-processing. The instruction allowed me to fully experience ‘the moment.’” —Tom T.
“Nat is a very patient, well spoken, educated person; he has a great vocabulary and truly knows photography inside and out and can present information in an easy-to-grasp way. He is more than just a lecturer, he is a real teacher.” —Jock G.
“Nat Coalson is not only a passionate photographer, but also an accomplished digital professional. This combination makes him the perfect instructor.” —George J. This class is currently closed to new registrations. Want to know as soon as registration is opening up again? Just pop in your email address below. We’ll never spam you and promise to keep all your details safe. 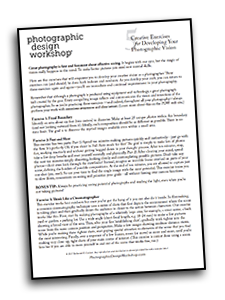 Your email address will only be used to communicate with you about upcoming photography courses at Photographic Design Workshop.